GumBusters - Chewing Gum & Graffiti Removal Service. GumBuster Junior - New !!! 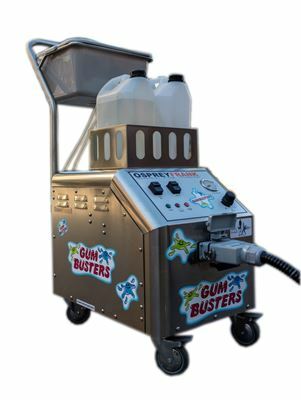 GumBuster’s patented GumBuster Jr. New Model Machine combines steam with an environmentally safe, non-toxic cleaning solution that disintegrates gum and grime on any surface indoor or outdoor. The GumBusters Jr. System out-performs the traditional methods of scraping and harsh chemicals. The gum is removed without disrupting normal business operations and eliminates those unsightly black spots from your sidewalk instantly. Compact and easy to transport, the GumBuster Jr. Machine offers proven performance and reliability. The super-heated steam is delivered at 300 degrees Fahrenheit at 6.0 bar pressure (90 PSI at the nozzle). Currently, there is no commercially available substitute or comparable competitive product with the same performance characteristics. There is no other product that can meet the demanding need of removing gum with the method and speed of our Gum Removal System. The Gumbuster system can also be used to clean and disinfect restrooms, tile grout, aluminum, stainless steel and to remove stickers. GumBusters' proprietary cleaning agent AAA Gumfighter Solution is extremely effective and completely non-toxic. The GumBuster gum removal system uses only 4 to 8 gallons of water per day. Our patented system removes gum from virtually any surface — indoor or out — safely and efficiently. The results are instant!